I’m so happy to announce another live class in the US! Granby CO, at Lonesome Stone Alpacas, Natural Fiber Mill, and Yarn. The class is for intermediate knitters. 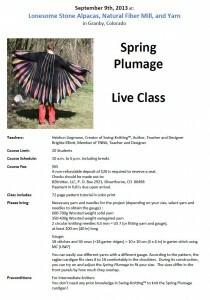 You don’t need any prior knowledge in Swing-Knitting™ to knit the Spring Plumage cardigan! From 10 a.m. to 6 p.m. (including breaks) we will understand the construction of the cardigan, and we’ll knit the first feather and triangle together. A non-refundable deposit of $20 is required to reserve a seat. Payment in full is due upon arrival. You can easily use different yarns with a different gauge. According to the pattern, the raglan cardigan fits sizes 8 to 18 comfortably in the shoulders. During its construction, you can try on and adjust the Spring Plumage to fit your size. The sizes differ in the front panels by how much they overlap.